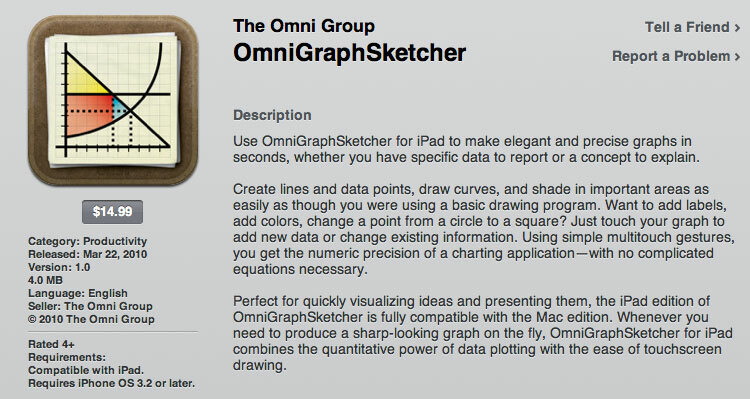 OmniGraphSketcher made it to MacRumors! A true milestone for a Mac nerd like me. You might say the difference is that I’m not a hacker. Let me say at the outset that I know many hackers, and I have much awe and respect for them. People in the hacker culture want access to every piece of the computer hardware and software, so they can tinker and explore and change things. This is what fuels their obsession with “openness.” To them, the idea of not being able to go in themselves and swap things around is genuinely frightening. I want none of that. I want my computer to “just work.” I want it to be well-designed and well-maintained — by somebody else (it’s handy to know some hackers). And yes, I still want to write software for it to accomplish the amazing and awesome things I could never accomplish without a computer. Just don’t make me go in and tweak some config file. I am living proof that interest in programming is not predicated on interest in hacking or “how things work.” Sure, now that I have a few computer science degrees, I do understand a lot about how computers work, and it’s fascinating. But unlike the many computer scientists who got interested in the field by wanting to reverse-engineer their favorite computer games, I just wanted to create. I built new games so that other people could play them (as I used to say, why would I spend hours watching a bunch of pixels blink on and off?). Apple is in the strange position of having a near-monopoly in some markets (such as high-end laptops) while not being particularly anti-competitive in their business practices. Oddly, they appear to just have no competitors who have been nearly as innovative in designing personal computers. I think they’re so far ahead of the curve partly because Steve Jobs is a humanist first, a technologist second. Not a hacker. A lot of people have asked me about my opinions on the iPad. Here are a couple of good articles that fairly closely match my thinking. Remember how Macintosh was intended to be the computer “for the rest of us“? That’s what we feel Apple’s iPad is: the best computing device for most of the things people use computers for. (Or, as Apple puts it, “the best way to experience the web, email, and photos.”) It’s the computer people can sit down and start using immediately, without training, whether they’re 2 or 92. That doesn’t mean you personally are going to want one today. But I’ll wager that within a few years (five at most), something like this will be your computer of choice. Magic vividly demonstrates how a first-time user’s experience is much different than an experienced user’s experience. It takes skill and practice to develop empathy for people who are not you. Quite a fascinating video. I sometimes ask, “is that profound, or just obvious?” It used to just be a joke, but I’m starting to think it’s a bit more… profound. What does it mean for a concept to be profound? The word itself has a few meanings (e.g. “a profound silence”) but the sense I’m referring to is defined in the dictionary as “having or showing great knowledge or insight.” I think that is necessary, but not sufficient. Just because a concept requires great knowledge or insight to arrive at doesn’t make it profound. It also needs an air of deep, elemental truth. It strikes at the heart of the matter. It’s simple and powerful. It may have required deep expertise to uncover, but now that it’s out in the open, it’s clearly the truth. My new working definition for profound is: obvious only in retrospect. One of my favorite examples of this is how Einstein discovered the profound and strange properties of the universe known as special relativity. It was already well established that the speed of light is a constant; Einstein simply started asking questions about what would happen if an object started traveling close to that speed of light. Then he applied known physics equations to help him answer these questions. His lines of reasoning were quite simple, and not particularly controversial. His results were obviously true — but only in retrospect. This concept also applies to design. Many of Apple’s best products have a simple elegance that makes you think “oh, of course.” You wonder why such products haven’t always looked or functioned like that, since it seems so obvious now that it’s in front of you. It has long been a tenet of design that the best, most thought-out, multiply-drafted designs are the ones that users don’t even notice, because they seem so obvious in hindsight. Indeed, I’m starting to think that if your design does not seem obvious in retrospect, you should be worried! After I took an Economics class and studied some human-computer interaction, the basic interface of the Graph Sketcher software I designed always seemed pretty obvious. The devil was in the details, but the big picture wasn’t particularly controversial. It was simply the clear and logical solution to the needs of economics students and teachers. At first, I didn’t know whether I should be offended by the comment. Looking back, I think it is one of the highest compliments my work has ever received. My first memory of glimpsing complexity in the mathematical sense was a planetary gravity simulation program in high school physics class. This was just a black-and-white program with little white circles that you could position in space, and change their size, which corresponded to their mass. Then you started the simulation, and these planets would whirl about in very complex ways that were predictable at the beginning but you hardly ever knew where they would end up over time. Ken Robinson, author of The Element, thinks that we need to change our guiding metaphor when thinking about physics and organizations to be an ecosystem metaphor — an appreciation of the fact that everything depends on everything else. In Ken Wilbur’s terms, this is the understanding that every holon is a part of some larger whole. Complex systems are difficult to represent because, well, they are so complex. If a function neatly describes the position of a planet over time, that function could simply be plotted. But complex systems (such as the simulation of multiple planets acting on each other via gravity) change over time in non-linear ways that don’t follow well-defined functions. If it were easier to create complex system models, it would be easier to see and understand and test and predict the connectedness of things. If you can’t plot it on a graph, the next best thing is to see it in action. We need the “spreadsheet of simulations” — software that is accessible to anyone and enables users to model and visualize complex systems. StarLogo is a step in the right direction, but it still requires users to learn a fairly difficult programming language. Is it even possible to model general complex systems without using traditional programming languages? I don’t actually know. But my hunch is that it is possible, and multi-touch interfaces could play a significant role. It’s been said that actually generating electricity from fusion is “always 30 years away” (since 30 years is what researchers have been claiming for decades). I just read a Scientific American article about the enormous challenges fusion has to overcome in order to be feasible, let alone practical, and I think I can now start saying: it’s never going to happen. Fusion is a classic nerd-project. It has that nerdy glamorousness about it — harnessing the fundamental reactions that power the stars. If only everything were uniformly dense, spherical, and 100 million degrees, it would work perfectly. The good news is that nearly all renewable energy is really fusion-powered, because it all starts with the power of the sun. Solar photovoltaics and solar-thermal generators obviously use the sun’s energy directly. The sun also keeps the atmosphere circulating, providing wind for wind turbines and rain for hydro dams. It grows the plants used to make biofuels, and it even grew the plants long ago that eventually became fossil fuels deep underground. Let’s leave the actual fusion to the stars. Robin is not a real yoga teacher yet, but the picture is so compelling that he felt the need to write a fake bio. Robin spent most of the first 22 years of his life studying every day and jogging every other day. Finally, when he graduated from college, his body couldn’t put up with it any longer. Back pain and knee problems led him to physical therapy, and he feared that the rest of his life would be filled with boring-as-heck rubber-band exercises. Then a yoga teacher offered to give classes once a week in Robin’s apartment building, which was too convenient to pass up. This teacher turned out to be the most caring, knowledgeable, inspiring, and hilarious person one could ever hope to meet. She helped Robin understand which muscles were overcompensating for which others, and she showed him how to practice yoga to improve core strength, flexibility, and alignment. There was also a bunch of other crazy stuff like hand stands, lion roars, and words like “supdebodikanasana” and “artichandrasana,” which overall kept things interesting. Ever since that fateful day, Robin has been studying less and doing yoga more. He believes deeply in living a balanced life — his yoga practice allows him to pound his knees during runs and crush his hips all day in front of the computer. 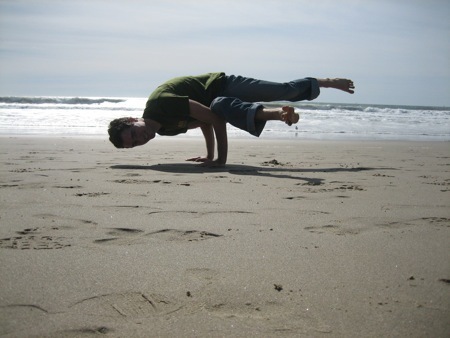 Over the years, he has taken yoga classes from dozens of instructors in Boston, Seattle, and elsewhere. There was the teacher who reminded everyone to “mmmm-breathhhhe.” The classes where you sweat so much you should have just used a towel as your mat. Classes like in the movies with beautiful 20-somethings checking each other out, and classes with plenty of rounder shapes. Because Robin came to yoga to heal his battered body, he was always especially mindful of the ways in which yoga poses can be designed to strengthen what is weak and loosen what is strong. Yoga has roots going back millenia, but very few people in ancient India spent all day sitting at a desk. Robin applies a healthy skepticism to the traditions and picks out (or makes up) the practices that are relevant specifically to the modern ways in which humans injure themselves for fun.